A S-300 long range surface-to-air missile system. Tehran had ordered five battalion sets of S-300 systems in 2007. The first shipment of S-300 air defense missile systems to Iran will be made within days, Zamir Kabulov, Special Representative of the Russian President for Afghanistan, told Interfax on April 5. Moscow and Tehran signed a contract for the delivery of five battalion sets of S-300 PMU1 air defense missile systems in 2007. The then Russian President Dmitry Medvedev banned the delivery of modern armaments to Iran in 2010, after the UN Security Council passed a resolution prohibiting the sale or transfer of heavy weaponry to Iran. The deal was terminated, and the upfront payment returned to Iran. The air defense missile systems built for Iran were scrapped. Iran filed a claim against Rosoboronexport [the other contracting party] to a sum of approximately $4 billion. 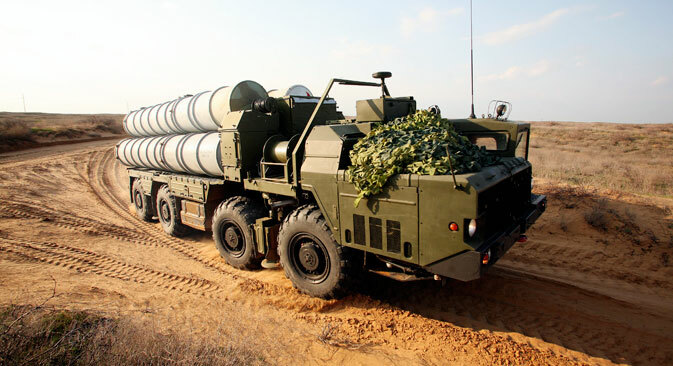 Russian Deputy Prime Minister Dmitry Rogozin said on March 17 that the implementation of the contract for the delivery of S-300 systems to Iran was proceeding as planned. According to the deputy prime minister, an agreement was reached at negotiations between Iran and the Federal Service for Military-Technical Cooperation, and a clause stating that Iran would withdraw its claim at a certain stage of the delivery was included in the contract.